– “Darkness came over all the land.” (Matthew 27:25) From noon on Friday until 3 pm, the skies grew dark. It’s hard to imagine what the people were feeling when they saw this happen, but I would think that some became fearful, terrified, realizing what they’d done, and that Jesus was indeed who He said He was. This was a very real picture of both physical and spiritual darkness that occurs without belief in Christ. Even nature all around gave testimony of who Christ was and the grief of what was happening. – At the very moment that Jesus breathed his last breath, the Temple veil that covered the entrance to the Holy of Holies, the actual dwelling place of God among the people, was torn in 2 from top to bottom. (Matthew 27:51) Sometimes in our minds, we picture a thin veil covering this entrance, but history records that the veil was actually about 60 feet tall and up to 4″ in thickness. The size of the veil would have made it impossible for any human to tear this in 2 pieces. This was a complete miracle from God’s hand, signifying that He had opened the door for us to come in and have relationship with Him. Jesus paid the ultimate sacrifice so the veil, or separation, was no longer needed. We can now enter His presence through Christ Himself. – Graves opened up and the saints came out and after the resurrection they appeared to many people. (Matthew 27:52-53) Can you imagine what this looked like? The dead arose when Jesus died. God brought to life what was dead to fulfill His purposes. Again He reminds us that the final victory of Christ conquered death. He is Lord over all. He reigns victorious over sin and death! – Lives were changed. Many began to realize who Jesus really was, the truth revealed, they could no longer deny it. Matthew 27:54 says, “When the centurion and those with him who were guarding Jesus saw the earthquake and all that had happened, they were terrified, and exclaimed, Surely he was the Son of God!” The realization sank deep. The Truth that had the power to change lives. To make all things new. To offer fresh starts, new beginnings, forgiveness, and purpose. Hi Debbie, What a beautiful post that honors our Lord. This is just what I needed for encouragement today. Thank you for this. A beautiful imagery that you gave us in showing that day that God/Jesus intersected our world in such a profound way! Unconditional love beyond comprehension. Reading this aloud, but to myself alone has given me new hope, new peace, renewed in all respects. It was the scriptures and God’s promise that saves my soul and renews my spirit with God. I needed this on this Easter. Earlier I was crying. My son has just gone to prison. I’m at peace now. Hi Debbie, thanks for sharing God’s words of encouragement. God wanted me to read this today and for us to be connected and share His powerful scripture. I was very low with alot of disappointments but God is faithful I feel strong and relieved. Iam only focusing and relying on Him in all circumstances. I’m so happy I came across your website Debbie! I’ve been reading a bunch of your articles tonight and I feel like you were speaking to me. The LORD has given you a gift of explaining HIS WORD and I’m encouraged to place my trust in the LORD for this emotional pain I have this night. I have SUBSCRIBED to all your social media sites to glean off of your wisdom given to you (us) from our loving LORD and SAVIOR JESUS CHRIST. God is so good! Thank you for the reminders at just how big of a deal Jesus’ death was. I am so thankful. Praise God for your ministry! Love your writing & your sharing of His writing to us! Thank you Debbie for the help you have given to me in Bible study, I would like if you can give me a short epilogue on Zaccheous, as I am leader in a prayer group and would like your, it is probably already on the web. Pray for us . We are refugees and need safe place. Romans 10:9 is misquoted. The post itself was very informative. I love how you point out how even creation cried out during these miraculous events. Being part of His creation, we join in with nature to honor and praise Him! Wow! Debbie, you reminded me of so much of the word today. It truly filled me up for this week as we are reminded of the resurrection. I am going to study on these throughout the week. Thank you for painting a picture of the awesome power and love of our Jesus. 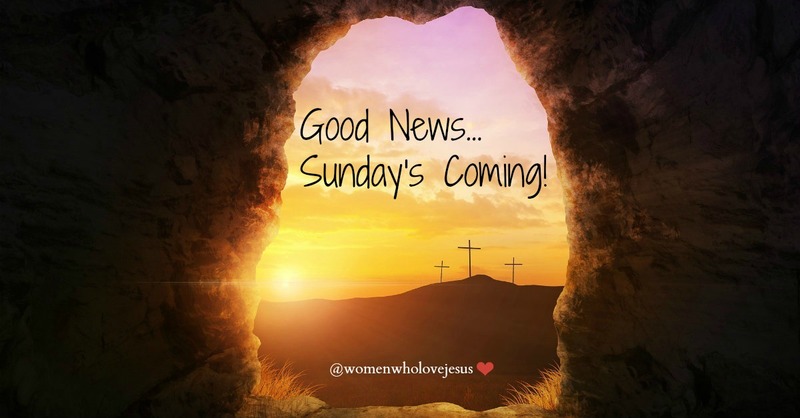 He is risen–hallelujah! Debbie, it is so easy to quickly read through the Easter story because we have read it so many times in the last. Thank you for breaking it down and reminding us of the awesome power that was displayed that day.